Travel with Kevin and Ruth! : What's wrong with this map? Most of our readers are from the United States, so I'm going to use that as the first comparison. Africa is three times larger than the United States. And yes, I'm including Alaska in that! So, we need to be telling people that we are specifically visiting Namibia and South Africa. (We've pretty much crossed Botswana off the list for this trip because there's simply too much to see and do in the other two countries.) How big is the country of South Africa? Well, it's about twice the size of the state of Texas! What got me talking about this today? Well, I saw a projection of just how big Africa is, and the fact that it's not accurate on most maps. And in fact this map is so typical, that it's the one used by Google. So, what's wrong with this map? Apparently lots. And a better question is, why is most of the world using a map that's not accurate? The most glaring example of what's wrong with this map is comparing the sizes of Africa and Greenland. Greenland of course, is that huge blob of ice near the top left of center. It looks about the same size as Africa, no? But in reality, Africa is fourteen times larger than Greenland! Notice on the map above that the equator (the geographical center line around the earth) is not in the center. The map unrealistically highlights the size of northern half of the world to make everything north of the equator appear larger than it really is. 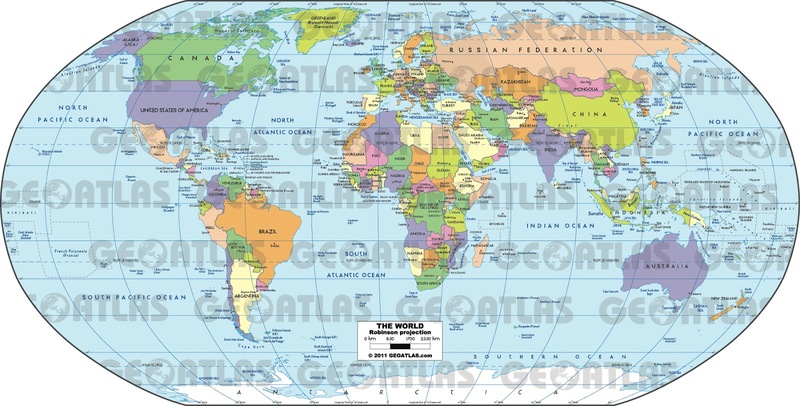 There are actually very few world maps available that are geographically accurate. I thought the idea of a map was specifically to be accurate! A geographically accurate map of the world. 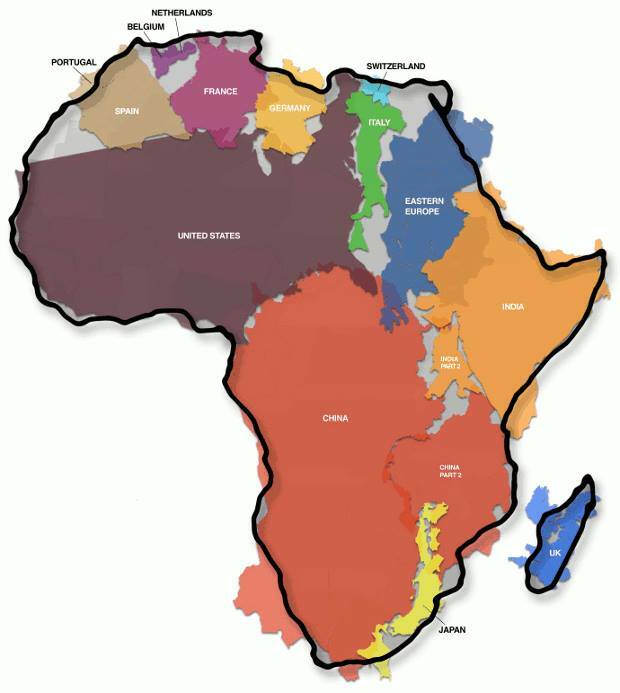 So, just how big is Africa? Well, you can fit the United States, China, and all of Europe into Africa! And with room to spare so you had better throw India, Japan, and the United Kingdom in there to take up the rest of the space! Africa is a huge area of land! It sure is and we will only be seeing a tiny bit of it! And here I was looking for Rhodesia, thinking that maybe you had found an old map with that country on it. Perspective is a hard thing to show on a flat map of a round earth. Is that why folks land in Toronto and think they can jump in a car and drive to Vancouver? You are very right and we have heard many stories from people who think they can quickly get to Vancouver, they have no idea. Bob is correct that perspective is distorted when a globe is adapted to a flat surface. All the countries furtest from the equator are stretched. Hi Diane! Although you are of course correct, the lower map that we show is the most geographically accurate available. It still begs the question of why we present the "typical" map to our schoolchildren under the guise of it being the way the world is made up. From someone who took a year of cartography classes in college, I can assure you that the center (Peters projection) map is no more "geographically accurate" than any other flat map. Why? It seriously distorts distances. Take Africa, for example. Is the continent really twice as wide north-to-south as it is east-to-west? No, it's not. That said, I'm no fan of the Mercator projection found in many classrooms. As Bob and Dianna have suggested, a globe would be far more educational. Hmmm. Valid point, and I see what you mean. Wow, Kevin, that's something I'd not ever addressed - in all my travels. It is hard to depict on a flat surface that which is a sphere to be sure. I'm finding it interesting and more interesting as I age to note the obvious discrepancies in teaching our children. Why can't they just be given "the facts, Mam!" Where did you find your geographically accurate map? Kevin found it just by researching on the internet. Even when he does find the information it then researches that to make sure that it is accurate. You can't always believe everything that you see or read without doing the research first. I am a huge fan of both geography and cartography. Actually, the Winkel Tripel and Robinson projection maps are the most geographically correct. Thanks for that catman. I shall include an edit above! Very intersting Kevin. I had no idea Africa was THAT big. But I have often wondered what they would have been and done if the "explorers" had left them alone and stayed home. We will never know. There is a tribe in northern Namibia, the Himba, that still live their life as they have always done and they haven't conformed to "western" ways. We are hoping to make a visit to that village when we are exploring Namibia. I think the google satellite images or the earth would be more realistic for sure. Google Earth to be more precise! Great post you guys. I had no idea about this topic. Fun and educational, all in one blog post! This is important. I want to note that ANY flat map MUST distort geometry in some way because the Earth is curved and not a perfect sphere. No map is perfect (unless it is a 3D sphere (using up to date data on Earth's surface)). Distortion are unavoidable (bc locations are projected from a complexly curved surface to a flat or simply curved map surface). Portions of the Earth's surface must be compressed or stretched to fit onto the map. Different map projections may distort the globe in different ways. A specific map projection can preserve ONLY 1 property: Area, Angle, Distance, or Direction. So how do we choose? It should be based on the purpose of the map, the scale or area to be shown, and what property is critical to preserve. But often it is whatever the map maker is familiar with and can find (since many map makers these days are not trained geographers/ don't know or care about distortion/ are just digital artists or laymen).